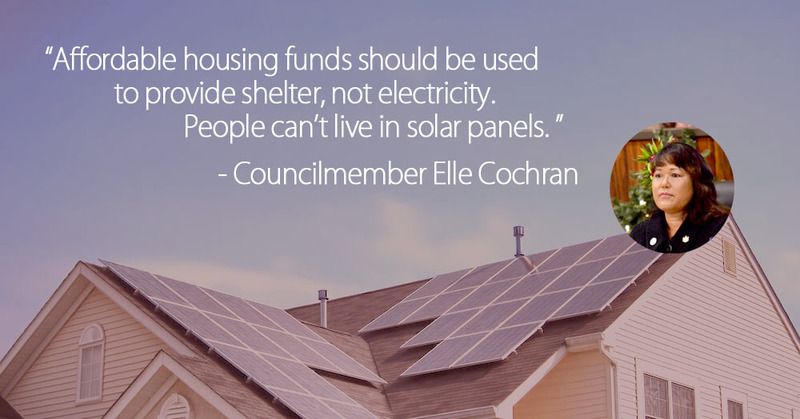 WAILUKU, Hawaii – Councilmember Elle Cochran is bringing light to a $442,000 appropriation from the affordable housing fund that is actually earmarked for solar panels in pending legislation. Cochran said the use of the money is inappropriate as affordable housing funds should be used to provide shelter, not electricity. The appropriation is included in the proposed fiscal year 2017 budget bill, which will be considered on first reading at the council meeting on Friday, May 20, at 9 a.m. in the Council Chamber. The funding is slated to provide photovoltaic systems on 33 units for the Kaiaulu housing project in Kaanapali. “As someone who cares deeply about the environment, I am not against installing solar panels on homes,” Cochran said. “But considering the extreme shortage of affordable housing we have, the county needs to be firm and focus every housing dollar within this particular fund to the construction of affordable dwelling units. Purposes and uses of the affordable housing fund are outlined in Maui County Code Chapter 3.35. The fund includes money paid to the county by developers in lieu of constructing affordable housing units, private donations and council appropriations, including a minimum of two percent of annual real property tax revenue as mandated by the County Charter. Cochran noted she is also supporting the availability of housing for residents by cracking down on operators of illegal vacation rentals. The council on Friday will also consider Bill 43 (2016), relating to short-term rental homes, which includes a Cochran-supported provision making illegal operators ineligible to apply for a permit for five years if they do not come into compliance within the six month grace period that is also provided within the bill. Cochran said she encourages testimony on both items, referencing Committee Report 16-84 for the fiscal year 2017 budget and Bill 43 for the short-term rental homes legislation. Testimony may be emailed to county.clerk@mauicounty.us.